30-31 July 2018, Accra, Ghana - National stakeholders convened in late July to provide feedback on PAGE’s draft study on access to green finance for businesses in Ghana. Green – or sustainable – finance can be loosely defined as finance resources generated to target positive social, economic and environmental outcomes or business practices. 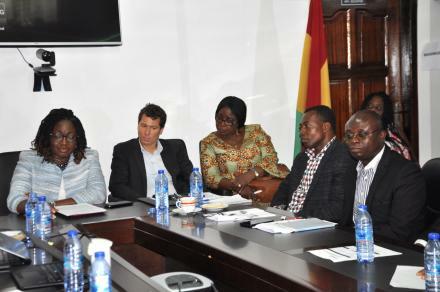 The meetings took place after an initial consultation, held on July 13th, which provided an opportunity for representatives from the financial sector, representatives from the Bank of Ghana and the Ministry of Finance, and representatives from other ministries that serve on the PAGE Ghana Steering Committee to review and provide feedback on an initial draft of the study. This most recent meeting served as a forum for obtaining feedback on the study from a wider selection of stakeholders including representatives from business and industry associations, rural lenders, academia, media, UN agencies, bilateral donors, and the World Bank’s International Finance Corporation. It also provided an opportunity for participants to share information about the challenges businesses face in obtaining green finance and provided insights into the criteria lenders apply in deciding whether to grant loans in support of green objectives to businesses. The participants also divided themselves into small groups to brainstorm around key topics: policy levers to drive green finance lending, development of a green finance programme and capacity building requirements. The feedback gathered from participants over the course of the two consultations will be used to further develop the PAGE study on access to green finance in Ghana. This study is intended to help policymakers address encumbrances to access to green finance and simultaneously generate demand from businesses for such financing. The feedback from the second consultation will also inform a green finance capacity building programme also supported by PAGE that will be implemented by a national learning institution. The institution will be chosen through a competitive bidding process administered by PAGE. 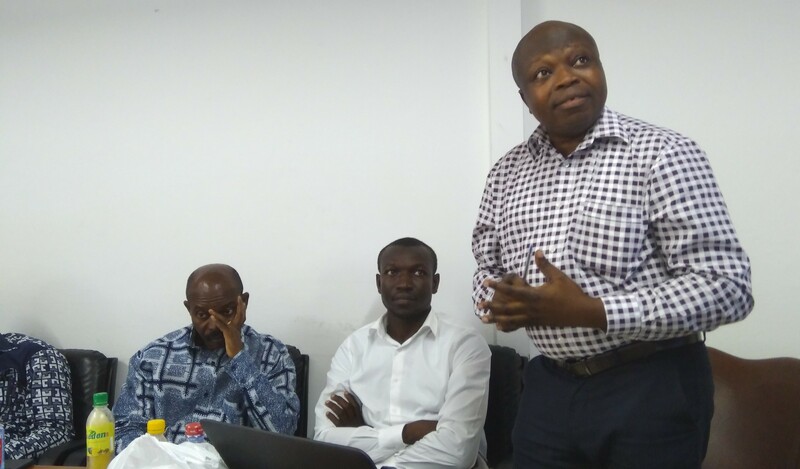 28 June 2018, Aburi, Ghana – PAGE and the Ministry of Environment, Science, Technology and Innovation (MESTI), held a media training on climate change and green economy entitled “Coverage of Climate Change and Green Economy-Related Sustainable Development Goals in Decentralized Development Work”. 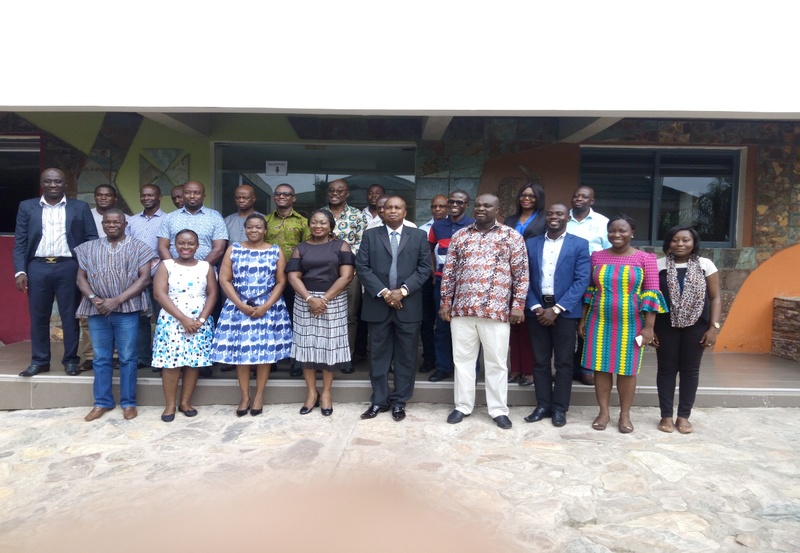 The training gathered journalists and other media practitioners from the southern zone of Ghana, which included the Greater Accra region and neighboring Western, Volta, Central and Eastern regions to deepen their understanding of green economy related concepts, the SDGs and climate change. During the opening remarks for the Southern zone training in Aburi, the Minister for MESTI, whose speech was delivered on his behalf by the Head of Human Resources at the Ministry, underscored the importance of strengthening the awareness and knowledge of the media as change agents and advocates for championing the path of Ghana to a green economy. 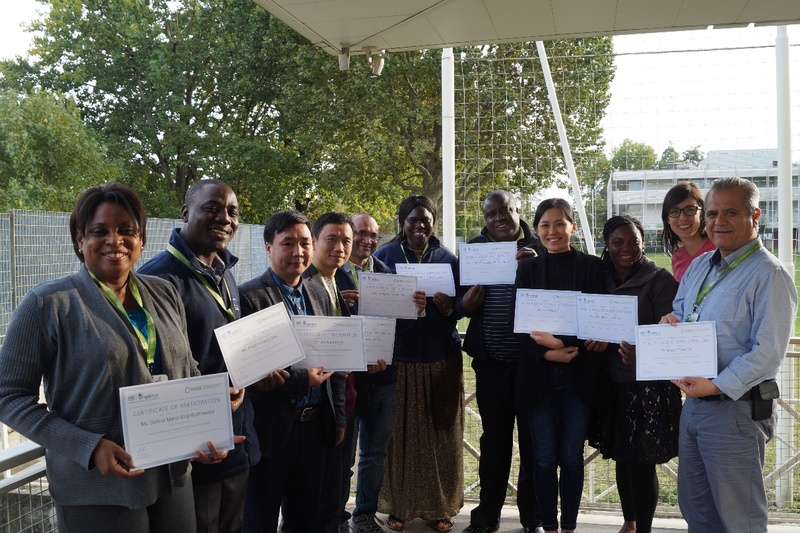 At the training, participants shared experiences on covering climate change and green economy related news, and now have an improved knowledge base to develop compelling stories that raise awareness among the general public and policymakers. The training also delved into the process of mainstreaming green economy, climate change and SDGs into Metropolitan, Municipal and District Assemblies (MMDAs), enabling media stakeholders to hold public officials accountable and helping foster a productive and healthy media environment. This effort is complementary to the PAGE assessment on “Mainstreaming Climate Change, and Green Economy SDGs into the Development Plans of MMDA’s”, available here. 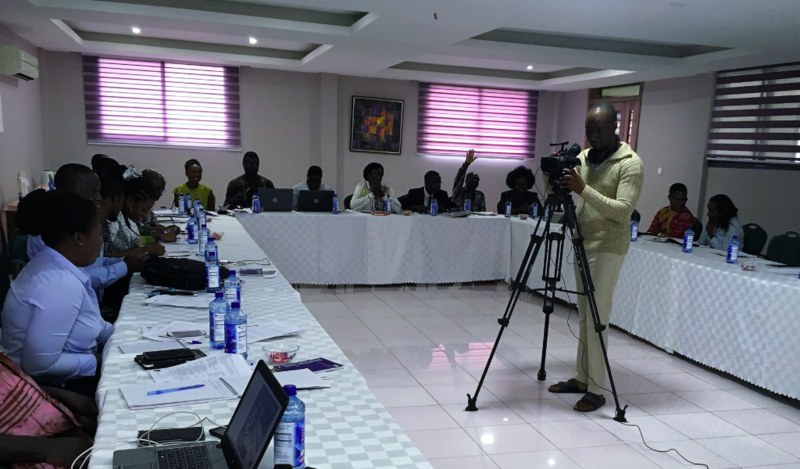 Additional trainings aimed at media practitioners are expected to take place in July in the city of Kumasi in the Ashanti region, for Ghanaian regions of the northern zone, namely the Upper East, Brong-Ahafo, Northern, Ashanti and Upper West regions. Accra, Ghana 28 March 2018 – In Ghana, the national bank is in the process of developing sustainable banking principles – that is, a set of rules that would require financial institutions to develop a management approach that balances the social and environmental risks with profit opportunities. The move takes place in a context of significant leadership by the Ghanaian government on putting into place green economic policies in line with the Sustainable Development Goals and the country’s ambitions under the Paris Agreement on Climate Change. It is now becoming evident that these efforts are piquing the interest of the private sector, which is recognizing that business models that promote environmental and social well-being have enormous potential to thrive in Ghana. Now, the Government and the private sector are working together to build to a sustainable financial system; exemplifying the importance of multi-stakeholder and cross-sectoral action towards green economy. With support from the IFC and the Government of Switzerland, the Bank of Ghana has already set seven principles to guide all banking activities. Additionally, private sector stakeholders have identified five sectors of the Ghanaian economy that will be targeted for improved environmental and social governance: manufacturing, energy and power, construction and real estate, mining, oil and gas, and agriculture and forestry. To understand how best to apply sustainable banking principles in these five priority sectors, the Bank of Ghana hosted a stakeholder consultation on March 28 in Accra. Representatives from the Bank of Ghana, Ghana Association of Bankers, Environmental Protection Agency, Ministry of Finance, banking institutions, businesses, academia and international organizations attended the consultation. The Partnership for Action on Green Economy (PAGE) is aiming to identify the gaps in the policy environment that, once filled, would drive demand for socially and environmentally sustainable banking services. To do this, and to complement the sustainable banking principles, PAGE is collaborating with the UN Environment Finance Initiative (UNEP FI) to undertake a green finance study in Ghana. 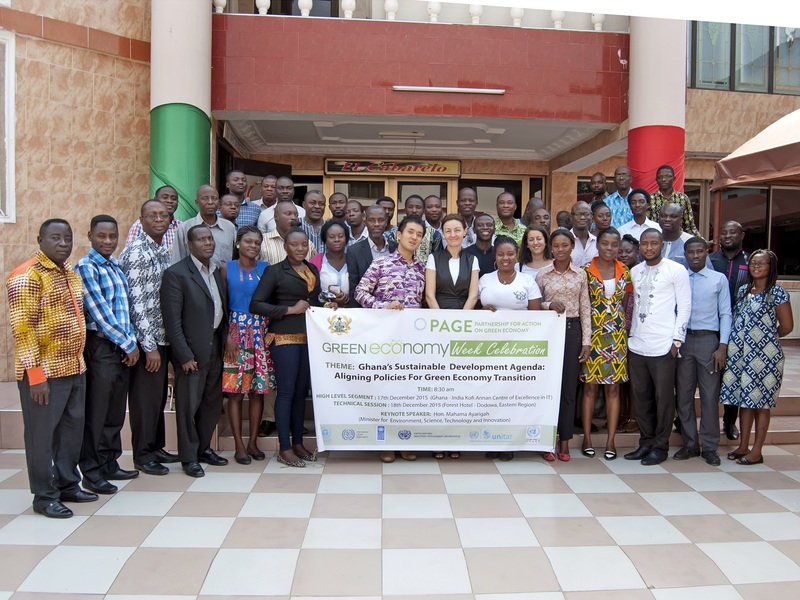 The PAGE-supported study will assess the level of integration of sustainability in the business sector’s operations, value chains and products and services in Ghana, and the taxonomies, frameworks, capacities, assessment methodologies and practices, structures and information disclosures available or needed for the identification and scaling up of green finance opportunities. Representatives from PAGE and UNEP FI participated in the stakeholder consultations and presented the aims of the green finance study. The forthcoming study will support the implementation of the Sustainable Banking Principles, particularly Principle 1 which requires banks to work with their clients to identify, measure, mitigate and monitor environmental and social risks. 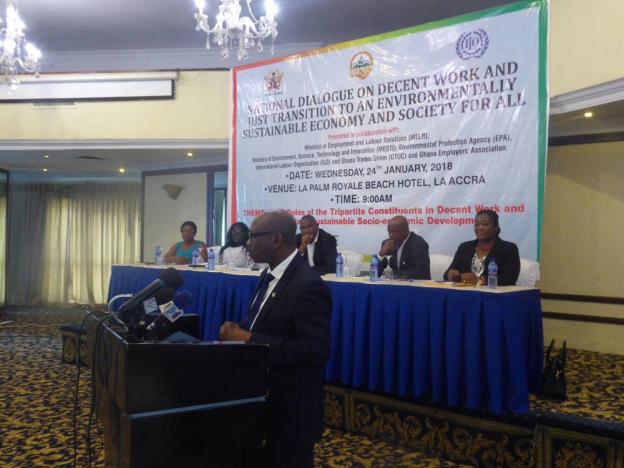 24 January 2018, Accra, Ghana - The National Dialogue on Decent Work and “Just Transition” to a Sustainable Economy and Society for all was organized by the Ministry of Employment and Labour Relation in collaboration with the Ministry of Environment, Science, Technology and Innovation (MESTI) and the Environmental Protection Agency (EPA). The two Ministries received technical and financial support from PAGE. The discussion centred on the “The Roles of Tripartite Constituents in Sustainable Development”. The event, which took place at the La Palm Royal Beach Hotel on Wednesday, 24th January 2018, brought together stakeholders from all sectors of the national economy. These included government agencies, trade unions, the Ghana Employers’ Association, academia, development partners and civil society organizations. The Paris Agreement requires individual countries to implement initiatives that mitigate the impacts of climate. In view of this and other frameworks, Ghana has developed its Nationally Determined Contributions and 31 prioritized programmes and projects. However, the mitigation and adaption actions themselves present a host of negative impacts, particularly on work. In order to address the issues, the International Labour Organization has developed non-binding Policy Guidelines for countries aspiring to green their economies. The purpose of the dialogue was to provide a platform to actors at the national level to discuss possible options for synchronizing climate change and labour/ decent job creation policies within the context of the “Just Transition” concept. Green job skills, training and education programmes are non-existing or do not enable the labour force take advantage of opportunities. Workers in the informal economy and energy are the most vulnerable. There is inadequate collaboration between government agencies in implementing of the components of the Sustainable Development Goals (SDGs). The impact of the NDCs on existing and future jobs has not been fully and rigorously evaluated. August 14 2017, Accra, Ghana - The energy was high in the room as Mrs. Patricia Appiagye, Ghana’s Deputy Minister of Environment, Science, Technology and Innovation crowned the gathering assembled to celebrate the inclusion of Climate Change and Green Economy into the National School Curricula. Young children in Ghana will be aware of climate change and green economy concepts as they go through school. The 10-year Climate Change Learning Strategy, a fruit of an extensive and multi stakeholder effort, lays out 13 priorities that need to be implemented to incorporate climate change and green economy learning into the experiences of the Ghanaian society. The Climate Change Learning Strategy is a product of UN CC:Learn in the effort to improve learning and awareness about climate change. 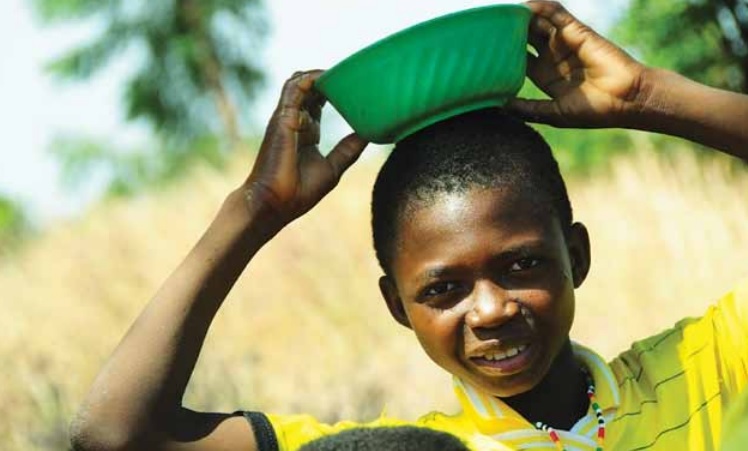 Ghana is an example of the program’s high level of impact at the National level, where UN CC:Learn has enabled the Climate Change Learning Strategy to prepare future generations with the explanations about what they can do to minimize the impacts of climate change. The workshop was also an opportunity to share experiences. Mrs. Sarah Natunga from Uganda pointed out that it is extraordinary to see her peers in Ghana face such a challenging issue, and highlighted that the process in Ghana was happening at exactly the precise time. “In Uganda, we included climate change into the school curricula at a point when the curricula were not being revised.” In Ghana, the National Climate Change Learning Strategy coincided with the formal revision of the National School Curricula and the workshop helped formalize Ghana Education Services evident support and compromise with the National Climate Change Learning Strategy. The next challenge the National Climate Change Learning Strategy will face is Parliament approval and formal inclusion into the country’s strategic framework. There is ample reason for optimism as the National Climate Change Learning Strategy is a fundamental aspect that will contribute to the uptake of the National Determined Contributions (NDCs) that country formalized as per the Paris Agreement. 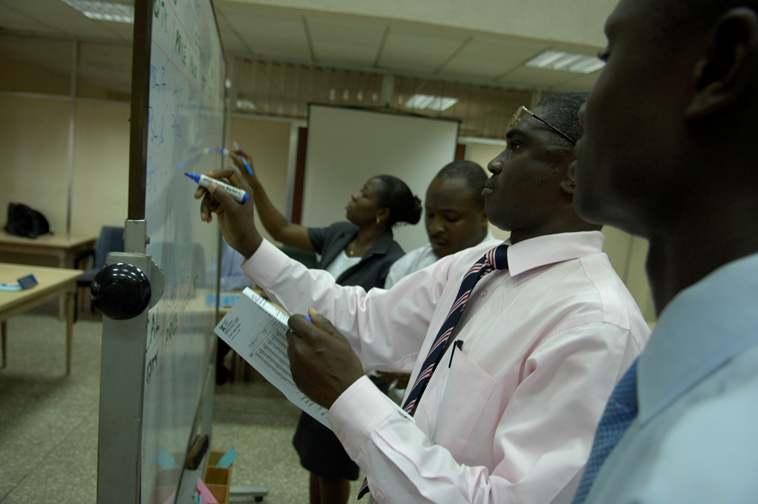 Accra, Ghana, 3 February 2016 — The World Bank Group announced the upcoming launch of a Climate Innovation Center (CIC) in Accra to support Ghana's green growth strategy. The CIC will support Ghana's National Climate Change Policy (NCCP), spearheaded by the Ministry of Environment, Science, Technology and Innovation, and will be financed through a US$17.2 million grant package recently approved by the World Bank Group. PAGE also supports the NCCP through resource efficiency in agro-industries, Green Economy (GE) public advocacy and social dialogue, GE training/capacity building and GE Knowledge Sharing. The Ghana CIC will help more than 100 local clean technology companies to develop and scale innovative solutions to climate change, and over 300,000 Ghanaians to increase resilience to climate change in the next ten years. Furthermore, through its support to local clean technology ventures, the center is expected to mitigate 660,000 tons of CO2 and contribute to the production of over 260 million kWh of clean energy. The center will be established at the Ashesi University College in Berekuso, with a mandate to support green businesses across all of Ghana's regions. The grant agreement was signed by Henry Kerali, World Bank Country Director for Ghana, and Patrick Awuah, Founder and President of Ashesi University College. "The Ghana CIC solidifies the role of the private sector in helping Ghana mitigate and adapt to climate change," said Henry Kerali. "By enabling entrepreneurs and green innovators to test and scale their business models, homegrown clean technology solutions can help the country build climate resilience, while also creating jobs and fostering economic growth." Supported by the governments of Denmark and the Netherlands, the center will be inaugurated in the second quarter of 2016 and will be managed by a consortium led by the Ashesi University College with Ernst & Young, SNV Netherlands Development Organization, and the United Nations University Institute for Natural Resources in Africa. The Ghana CIC is part of the World Bank's Climate Technology Program and its global network of Climate Innovation Centers. Other centers have been established in Kenya, Ethiopia, the Caribbean, South Africa, Morocco, and Vietnam. 1 February 2016 - The Partnership for Action on Green Economy (PAGE) is pleased to announce the release of four country-level Green Industry Assessments. The assessments provide in-depth examinations of the role of industry in facilitating the transition to a green economy in each country. They also provide analysis of current industrial patterns and review relevant planning and policy. The assessments include recommendations for how governments can better support the transition to green industrial production. This study identifies many strengths and assets which can support and facilitate the transition to green industry in Burkina Faso, as well as many challenges which may impede progress. The study provides recommendations for how a green industry transition can succeed. 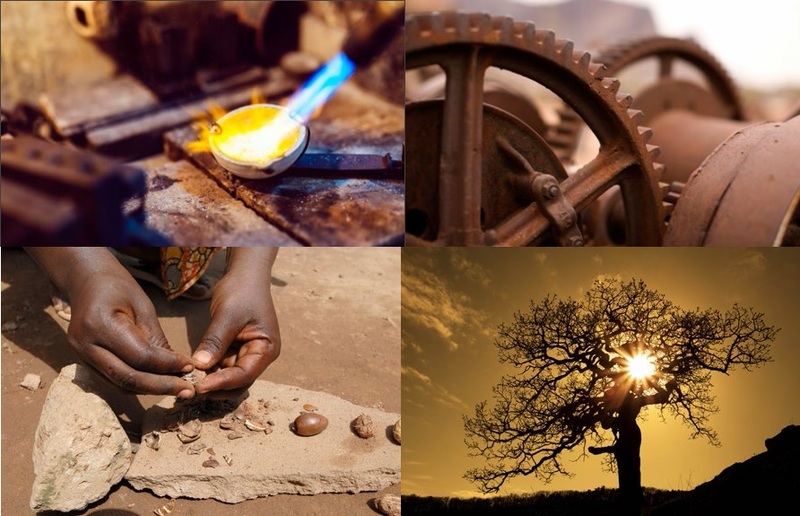 This assessment provides an in-depth examination of the role of industry and trade in facilitating the transition to a green economy in Ghana. The assessment reviews the multiple planning and policy regimes in place. It identifies a set of both modified and new policies to support the transition to green industrial production and trade. The report identifies further opportunities for the international community to assist Ghana to transform its economy. This assessment investigates the potential for green industry in Peru and provides recommendations for the creation and support of green industry as a fundamental part of the country’s transition to a green economy. This study analyses the opportunities that Senegal has for advancing green industry as well as the obstacles that must be overcome in order to realize a green industry transition. It examines political and legislative constraints as well as technological and human capacities. It provides recommendations for how to address constraints in order to realize a green industry transition.